Sina Candrian of SUI is next. She is the third rider in the second and final run. Remember, Canada's Spencer O'Brien is 7th in the order. Will it be enough to bump Jenny Jones off the top spot? OMG SINA CANDRIAN. 1080 madness! The wait has been pretty long but 87.00 is the score for Candrian. Candiran scores an 87, she sits in second right behind Jenny Jones. Sarka Pancochova of CZE went down hard, she's up on her feet though. Pancochova goes down hard, but looks to be getting up slowly. Crowd cheers as Pancochova gets up and makes her way to the end of the course. Proving girls are tough, Sarka Pancochova had a horrible crash - knocked out - and got up an boarded off the course. Love from the crowd. #CZE Sarka Pancochova takes a hard fall in her second run, remains in Bronze position with an 86.25 from her first run. Czech Pancochova went down hard, scary moments at the #Olympic #slopestyle . Appears to be okay, but was just ragdolled down the course. Finland's Rukajarvi puts up 92.50, in first place now. She's on the course, come a long way to get here. Injury, everything, this is big. Touches down on the second jump. No go today for Spencer. Spencer touches down with her hand. 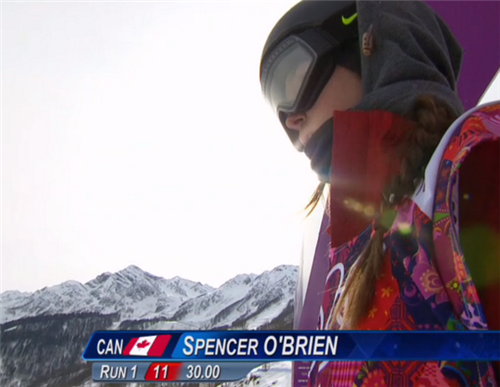 Tough day for Canadian @spencerobrien looking to improve on 1st run score of 30.0. Too bad for Spencer, she did so much to come back from injury and be here. Big ups to @spencerobrien on a tough one going for it today. Torah Bright from Australia now up. Torah Bright in 7th place. Jamie Anderson lays down an impressive run, will it be enough for gold? 95.25 for Anderson, she's in the gold medal position with 2 riders remaining. Anderson will take the first ever Olympic gold medal in ladies slopestyle.